Revenue in the Cider, Perry & Rice Wine segment amounts to US$2,247m in 2019. The market is expected to grow annually by 4.4% (CAGR 2019-2023). In global comparison, most revenue is generated in South Korea (US$57,871m in 2019). In relation to total population figures, per person revenues of US$6.83 are generated in 2019. The average per capita consumption stands at 0.9 L in 2019. The Alcoholic Drinks market segment Cider, Perry, and Rice Wine includes fermented alcoholic beverages that are not part of the Beer and Wine segments and is constituted by fruit wines like cider and perry and rice wines like Sake and Soju which are particularly important in Japan and Korea. Also included are palm wines and similar beverages. The market for Alcoholic Drinks is structured into off-trade sales (in stores) and on-trade sales (in bars, restaurants etc.). Statista values off-trade sales at retail prices and on-trade sales at purchasing prices to the on-trade establishments. Additional markups for hospitality services are therefore not taken into account. 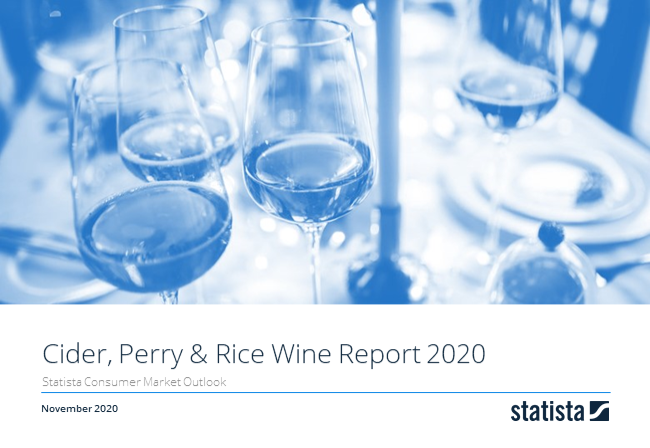 Reading Support Revenue in the Cider, Perry & Rice Wine segment amounts to US$2,247m in 2019. Reading Support The Cider, Perry & Rice Wine segment is expected to show a revenue growth of 3.8% in 2020. Reading Support The average revenue per person in the market for Cider, Perry & Rice Wine amounts to US$6.83 in 2019. Reading Support In the market for Cider, Perry & Rice Wine, volume is expected to amount to 305.8 ML by 2023. Reading Support The market for Cider, Perry & Rice Wine is expected to show a volume growth of 1.1% in 2020. Reading Support The average volume per person in the market for Cider, Perry & Rice Wine amounts to 0.9 L in 2019. Reading Support The average price per unit in the market for Cider, Perry & Rice Wine amounts to US$7.98 in 2019. Reading Support With a market volume of US$57,871m in 2019, most revenue is generated in South Korea. Here you can find more studies and statistics about "Cider, Perry & Rice Wine".